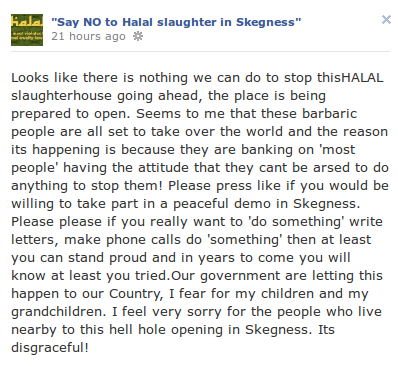 The fascist British National Party will hold a demonstration outside Skegness’ halal slaughterhouse today. In the absence of a genuine animal rights movement, the BNP is exploiting the real concern of local people about the treatment of animals for its own racist and divisive political agenda. 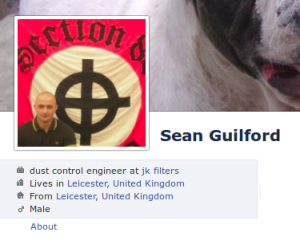 The BNP’s supposed stance against animal cruelty is hypocrisy. The party has given active support to fox hunting in the past. When the Hunting Bill banning the hunting of foxes with dogs was given the Royal Ascent, the BNP announced that “BNP supporters were devastated by the news” calling fox hunting “a sport which has an important role to play”. 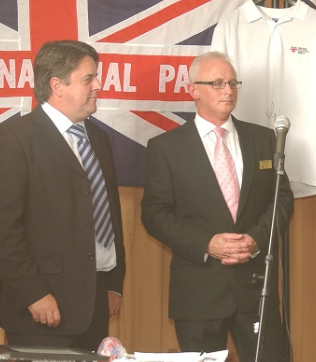 (3) The BNP is only interested in recruiting people and winning votes, not the plight of animals. 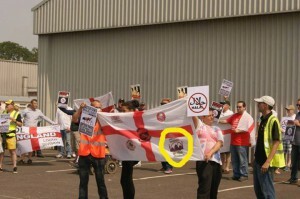 Unlike the BNP, East Midlands Anti-fascists are opposed to ALL animal cruelty. (4) We do not make distinctions based on the ethnic or religious background of the perpetrators. Under the coalition government’s regime of austerity, ordinary people are suffering due to wage freezes, job losses and cuts to public services. Because, unlike the main parties, the BNP have no history of mismanaging the country, some people are tempted to give them their support. However, the BNP’s divisive policies offer no solution to the current crisis, only serving to divide the working class along racial and cultural lines and making it easier for bosses to exploit us. East Midlands Anti-fascists oppose the BNP and other fascist groups because we believe the only way we can change our everday lives is by working together: workers and the unemployed, women and men and people of all ethnic and cultural backgrounds. It is corrupt politicians and leeching company bosses who are holding us down, not immigrants or Muslims. We want to shut down the Skegness slaughterhouse and all factory farming. We also want to shut down the anti-working class policies of the BNP. 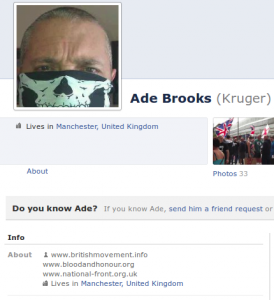 (3) The Real Countryside Alliance (http://www.realca.co.uk/violence/hunting-and-racism) also lists the extensive links between hunting and the far right. They may have been hailing their miserable demo as a success in public but privately Lincolnshire Coastal branch of the BNP were fuming. A number of activists were so angry with the mismanagement of the branch and poor advertising of the demo that they handed their membership cards in on the spot! Posting on the Boston Protest Group page, Dean Everitt moaned about the “crap turnout”. Various explanations were offered such as “People were probably put off by the weather and the BNP” because “BNP means violence to alot of people” and “the BMP [sic] and mismanagement go hand in hand”. The result was that “the bnp who organised it lost a couple of supporters today as they werent happy at all”. 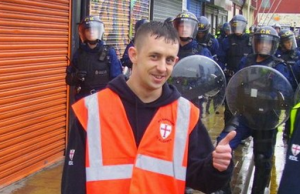 Former BNP member Stu Green was one of those who left in disgust: “after the farce in skegness i handed back my B N P membership card and i wasent the only 1”. 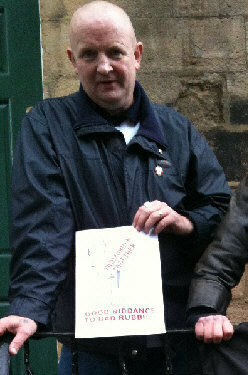 Commenting on the demo, branch organiser Robert Ashton said “it shows we are together of this issue”. As usual, the BNP are lying through their teeth. 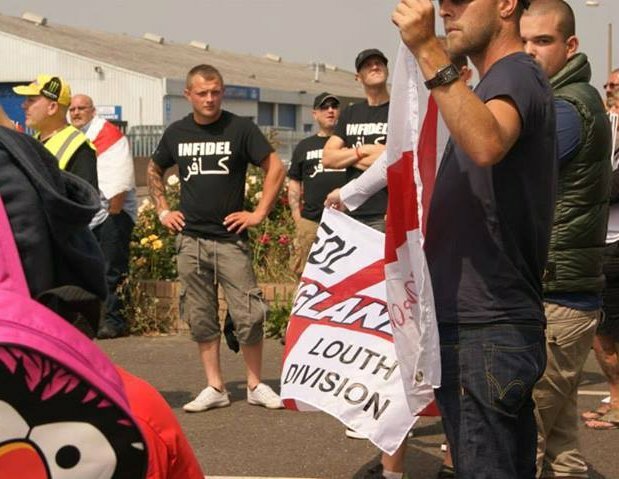 Despite not managing to attract as many people as the even more lunatic National Front did in September, the BNP are hailing their halal demo in Skegness as a success. Their photo depicts just under 30 fascists outside a warehouse in the middle of nowhere. Unfortunately, the local paper, the Skegness Standard, is helping them along by giving their efforts a feature article. Perhaps this is because a few days ago they decided to publish a letter from an equally unreliable source, the owner of the slaughterhouse, who claimed the BNP’s publicity was helping him find trade. This is probably some hack’s idea of “balance” although of course no anti-fascists or genuine animal rights activists have been quoted. …whatever that means. Maybe that they don’t agree on much else? However pathetic their demo, it is a major success for the BNP that they were able to semi-publicly organise a demonstration and leafleting session unopposed. 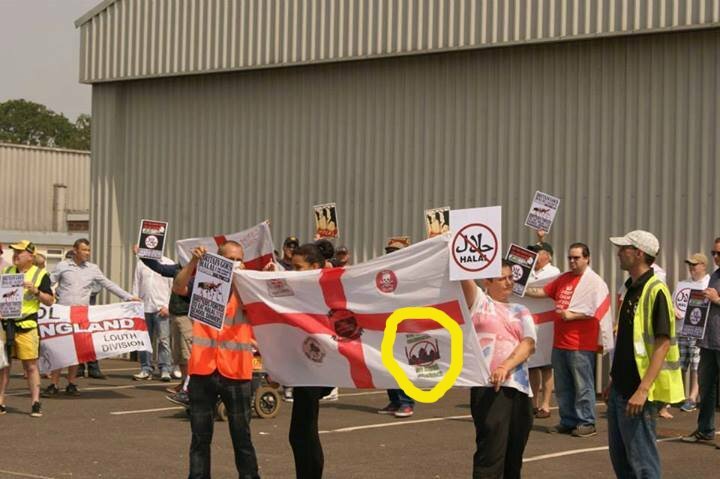 In the absence of a non-racist animal rights campaign, the BNP are being able to lead the campaign against the slaughterhouse. In the absence of an organised local anti-fascist movement, they are able to take their poisonous message to the streets freely. The branch say the party will be back for another demo in Feb or March to “gain strength for its party locally”. Let’s hope that next time they do not have such an easy ride. The BNP will be meeting at The Victoria on Wainfleet Road for their Day of Action against Skegness’ Muslims from 11.30-12.00 this Saturday. According to our source, the landlord knows about the event and is supportive. The pub is not far from the halal slaughterhouse on Heath Road. The Victoria can be contacted on 01754 765124. 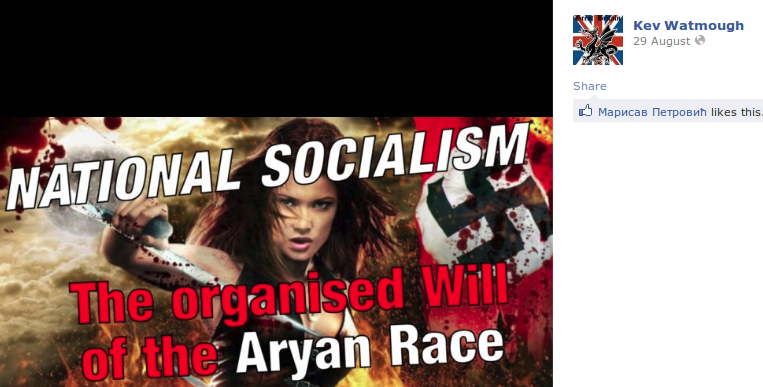 Don’t forget to let the BNP know you’re coming: 07714009285. 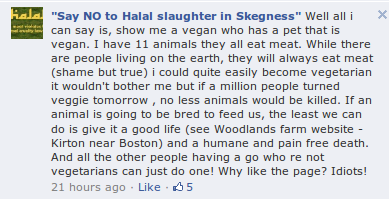 Lincolnshire Coastal branch of the BNP have announced that they will be holding a “Day of Action” against the Skegness halal abattoir this weekend. They are meeting at 11.30am on Saturday 12th and advise interested parties to call 0771 4009285 to receive re direction point details. 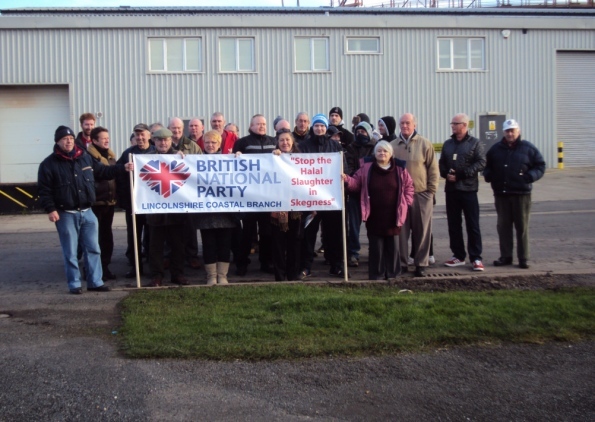 The local BNP have been trying to exploit objections to the opening of a halal slaughterhouse for their own racist agenda since the summer and party leader Nick Griffin popped over for a demo in October. 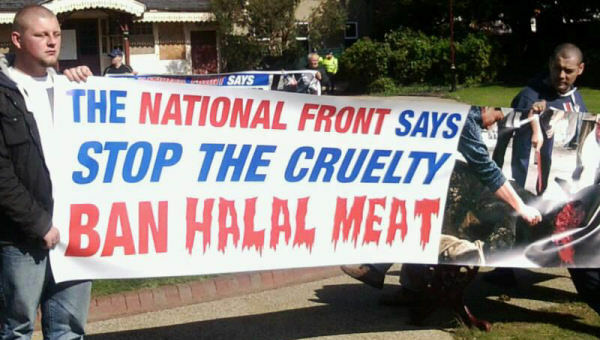 The BNP do not protest similarly cruel processes routinely carried out in factory farming or kosher slaughter, which is essentially the same as halal, choosing to focus solely on Muslims. They are not genuinely interested in animal welfare; they are just jumping on a bandwagon in the hope of getting support. The Lincolnshire Coastal Branch is run by Robert Ashton, a “sales and marketing executive” who runs UK Indoor Cycling in his hometown of Holton-le-clay, Grimsby. He reckons the local BNP have had record numbers of enquiries since the news of the slaughterhouse’s opening was announced. We will see what this translates into on the street on Saturday. 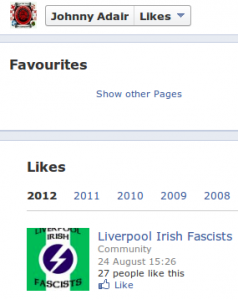 The BNP are not the only fascist group to have a go at latching onto the issue. The National Front went as far as holding a poorly attended national demo of has-been Nazis while confined to a park in September. Other campaigns against the slaughterhouse have distanced themselves from the far right’s fake concern, which is clearly seen as a major setback and embarrassment to their cause.